The Army Fire Station was built in 1906 complete with stabling for three horses. It was manned by soldiers from various units stationed in Bordon acting as firemen, and horses and drivers were provided by the Army Service Corps. In 1920 the Brigade changed from horse drawn vehicles to motor transport, when the famous Thorneycroft fire engines were introduced and the Army continued to provide the firemen. During this period a section of Royal Military Police occupied a part of the fire station, and in the early days of World War II, this portion was used by the Officer in Charge of the Barracks. In 1938 the role of firemen was taken over by civilian personnel, but an Army sergeant was in charge with two corporals. At the outbreak of World War ll, the firemen reverted once more to military personnel and in 1940 the new Leyland fire engine was introduced to the service. In 1958 the Fire Brigade was completely staffed by civilians and the appliances were changed to the Bedford 3 tonners. These were replaced in 1973 by Bedford domestic Water Tenders carrying 450 gallons of water. 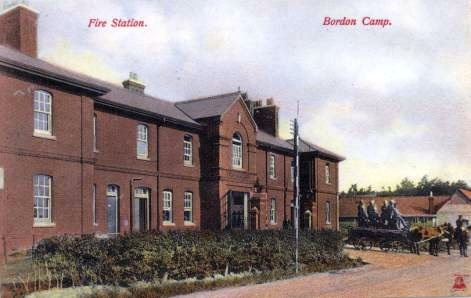 In competitions with other Army Fire Brigades, Bordon has always acquitted itself well. In 1968 the Brigade won the ATV Trophy for which they were given only two days notice to prepare, and in 1975 won the Reynolds Shield which is awarded to the Army Fire Brigade obtaining the highest points in the district (Technical Efficiency Inspections). The Brigade served not only the military Garrison but also the local community, and in 1976, the year of the great drought, proved to be a very busy one for the Brigade, answering some 529 calls, mainly heath fires around the Longmoor and Bordon area. As may be imagined, the firemen, apart from coping with fires, have had many and various extraneous duties to perform. These have ranged from dealing with the many accidents at the crossroads to rescuing cats up trees, and on one occasion in 1948 acting as midwife to a squatter's wife who could not reach the hospital in time and whose baby was born in the watchroom. In 1989 a new civilian fire station was built in Conde Way, and the RAF took over the old station. It was renamed Oakhanger Fire Station, but was eventually closed in the autumn of 2005 and purchased by EHDC and is now the Eco Station. On the north corner opposite the Fire Station stood the stables and groom's cottage of the General Officer in Command (seen behind the fire station horses). This was on the site of a public house, which closed at the end of the 19th century and was known as the Bank of England. It was in this pub that Mr Balfrey, who lived at the turnpike house at Sleaford, was nearly hanged! It appears that one evening several hearty men were partaking of a pint, and amongst them was a man who thought of applying for the job of public hangman. One of the party bet the prospective applicant that he could not tie a hang man's knot, and Mr Balfrey volunteered to be the 'victim' and stood on an empty beer crate. A rope was thrown over a beam and the future hangman had just finished trying the knot when the assembled company heard the clatter of a horse-drawn fire engine and rushed out to see where the fire was. In the scramble to get out, the beer crate was knocked from under Mr Balfrey's feet and he was left hanging there with his toes just touching the floor. On the return of the party they found not only the air blue but poor Mr Balfrey as well. They cut him down just in time. Later Mr Balfrey established a newsagent's shop in Station Road. It was taken over in 1968 by Mr & Mrs Pears, from his grandson when he emigrated to Australia. This ended a 74 year family connection with the military in Bordon. The stables were pulled down in 1961 because, by blocking the view they caused many accidents at the crossroads. In May the following year the County Council bought the land on either side of the crossroads to improve the sight lines.